If you’re an author, published yet or not, you need your own website. Period. Why am I so forthright about this? Because of the realities of publishing today. You’ve heard and read of your need for a platform—a following, a tribe, visibility. Well, that all starts with your own author website. Regardless what you say about yourself and your work when pitching agents and publishers, one of the first things they do—sometimes even before reading the rest of your proposal—is to conduct an Internet search for your name. The first thing that ought to pop up is your author website. Google my name and you’ll be directed to JerryJenkins.com. In fact, you’d be hard-pressed to Google any published author’s name and not find their website with a custom domain name (usually, like mine, their own name). No way around it, this is crucial today. Your author website serves as a hub for your writing. It’s where agents, publishers, readers, and fans can learn about your work, put a face to your name, and contact you. I urge you to avoid the temptation to settle for one of the quick and easy website solutions that looks like everyone else’s and has a small-time feel. Maybe you’ve already done this, unaware of a vastly superior option. …which I’m about to show you in this guide. Give me about half an hour, and you—and anyone you tell about it—could be admiring a gorgeous new site all your own. Imagine a publisher trying to decide between you and another writer trying to break into the business or pitch a book. What will they find if they Google your name? Just like dressing your best for a job interview, your professional-looking website puts your best foot forward. It establishes you as a serious professional. 2. A showcase for your work. Your author website becomes your home base, as if you had a corporate headquarters. It’s your showroom on the Internet where you can display your best work. Your author website lets you host a blog, as I do here. That becomes another showcase of your writing, and it also lets others contact you. People who enjoy a blog like to get in touch with the writer and say so. They also like commenting, discussing, criticizing, praising, opining. And once you’re a published author, this is where readers of your book can connect with you. 3. An opportunity to build a following. This is one of the best benefits of an author website, because it’s what publishers and agents look for in potential authors. Here is where you can collect email addresses and build a list. Get your growing tribe interacting with you and with each other by posing a simple question or taking a brief survey on their favorite things: books, movies, celebrities, you name it. You’ll find that as your list of followers grows, you’ll gain self-confidence. But even better, publishers will discover you have a following, a tribe—a platform. So, you’re convinced of the need and eager to enjoy the advantages of your own author website, but maybe, like me, you’re not a techie. The whole idea of creating a website intimidates you. Don’t worry. With the following simple instructions, you should be able to build yours from scratch in the next hour. Imagine enjoying your very own great-looking site, bearing the .com name you choose (Hint: it should always be your name). 1. Choose a company to host your site. If even the idea of “hosting” a site sounds foreign to you (it did to me at first too), think of the Internet as an apartment complex. Tenants decorate their apartments the way they want—but they don’t own that space. The landlord does. The tenants simply rent. On the Internet, a few landlords own the hardware that makes websites work. These landlords are called hosting companies, so you rent your online space from them. Of course, they don’t own your website. You own that and are responsible for everything posted there. Your hosting company sees to it that your website is broadcast onto the internet. For most budding authors and bloggers, I recommend Bluehost as your hosting company. Until you start reaching hundreds of thousands of readers, Bluehost should be perfect for you. Bluehost is inexpensive. It broadcasts a website for less than $9 per month, about 30¢ a day—a wise investment in your writing career. Plus, they offer a 30-day money back guarantee. Bluehost has great customer service. Their people are available and easily accessible 24/7. WordPress is a simple tool that helps you easily create a good-looking website. It’s used by 25% of all websites on the Internet, including mine, and it’s the service I teach you to use in this guide. Bluehost has supported WordPress for over 10 years and has in-house WordPress experts, if you ever have a question about it. To get started with Bluehost, click this link. Full disclosure: I get a commission (at no extra cost to you) if you use this link to sign up for a Bluehost service. But I’d recommend Bluehost regardless. I’ve been a satisfied customer, and they provide a fantastic service for authors. After that page opens in your web browser, click the green “get started now” button. Note: Bluehost requires at least a one-year payment, which is how they can remain so affordable. The prices above reflect their standard 12-month plan. Bluehost often runs promotions that provide discounts for first-time users. The longer the term, the lower the monthly price. Their promotional prices apply to the first term only. So, the longer your first term, the longer you receive the discounted price. If you’re new to this and envision one website, Basic should be all you need. If you’re considering multiple websites, you’ll want to study the more extensive plans. Click the green “select” button under the price. This is easier than it sounds—just use your name! I recommend capitalizing each of your names for easier readability, but that’s not mandatory. If your domain name is already in use, you’ll get a message that says your choice is “not available for registration” or something similar. A. Choose a different website extension. “.com” is preferred because it’s most common, but “.net” or “.co” work just as well. B. Choose a new domain name. Keep it simple—“TimothyWoodfordWriting.com” is good; “TimothyWoodfordsGreatWritingWebsite.com” is not. Keep your domain name simple, professional, and clear—not quirky or extravagant. After you type in your new domain name, click “Next” and you will be taken to the “create your account” page. After completing this form, scroll down and complete the “package information” section. Bluehost tries to upsell a few things here. In my opinion, the one worth buying is Domain Privacy Protection—but it’s your call. With the Prime Plan, this is included free. It is not included in Plus or Basic. Domain Privacy Protection ensures that when someone looks up your website, they do not see your individual contact information, but rather Bluehost’s. It’s an extra 99¢ per month. The last section on this page is “payment information.” Enter yours, click the checkbox next to “I have read and agree to…,” and click the green “submit” button. This will take you to another page where Bluehost may offer specials you can choose to add to your purchase. Or not. You can click the “no thanks” button. Then you will be taken to a “Welcome to Bluehost” page to create a password. After this, you’ll be taken to a log in page. Click the blue “Log In” button and enter your email and password on the next screen. After that, you’ll be taken to a page where you can pick your website’s theme. Pick one that suits your taste. Remember: this is your website. Have fun with it! After you pick your theme, you'll be taken to the page below. Click "Start Building." Now you want to create a tagline. (Example: Mine is “New York Times Bestselling Novelist & Biographer.”) Jean Oram has a great post on creating author taglines. You’ll find more very effective examples there, which should give you some powerful ideas for your own. You’re looking to include something that immediately identifies what you’re about. Novelist Brandilyn Collins uses Seatbelt Suspense®. Novelist DiAnn Mills uses Expect an adventure. Your goal should be to create a blog through which you can build a following. If you’d rather skip this step for now and have your first entry be your first complete blog post, that’s fine, too. Next, give your visitors access to a welcome page (some call this the landing page) where they can get acquainted with you and your site, even before you start blogging consistently. This would be a good place for a photo of you and a brief bio. I’ll get to those specifics a bit later. The next page asks if you would like WordPress to create a “Contact Us” page. Click “yes.” This will give site visitors access to you. If you’re like me, this will quickly become one of your favorite features. I love to know people are visiting and what they think. But of course the best benefit is giving agents or publishers a quick way to reach you if they happen to see something they like. While that may seem a remote possibility now, new authors are discovered every day. And remember, when you’re pitching you work, your website is the first place an agent or editor will look for to learn more about you. You want it—and you—to appear as engaging and professional as possible. The next page asks if you would like to connect your Jetpack profile to WordPress. This refers to a statistical tracking program some site owners love and others ignore. You can determine later if it’s something you want to pursue. Click “Not now.” You can always come back to this later. The next page gives you the option to customize your site. Let’s wait on that for now too. Click the blue “X” in the right-hand corner of the window. This takes you to your dashboard. Click “Pages” on the left sidebar. Step 3: Click the “OK” button. Step 4: Add a description of your writing. Remember brevity and professionalism, but be sure you include what visitors—including agents and publishers—would want to see. Tell of your previous projects, and add links (clickable web addresses) to them. If that’s beyond your capabilities right now, trust me, someone in your orbit will be able to show you how to do this. If I learned it, you certainly can. Pretty much anyone under 30 will be computer literate and can help you quickly master this. Meanwhile, I’ll list the steps if you’d like to try it on your own. Step 5: Click the blue “Update” button. Step 2: Click the chain link icon (circled in red below). 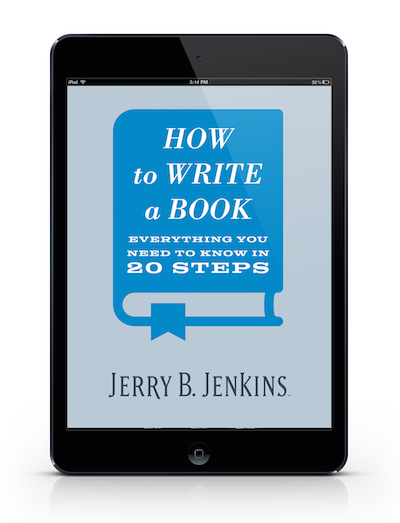 Step 3: Copy and paste into the text box the URL (web address, like www.JerryJenkins.com/books) you want to link to. After you’ve done that, click the blue “Update” button. After you click the “Update” button, click “Pages” in the sidebar on the left side of the screen. This will be that first page visitors see at your site—the welcome or landing page. Remember, this is where you show a good photo of yourself and tell a bit about yourself. Step 2: Click the “Add Media” button. Click the “Select Files” button on the page that opens, and find the photo of yourself you want to use. After your photo has been inserted into the page, add a short bio. Focus mainly on your writing, but add a little personal information as well. Walking the line between just enough and too much can be tricky. Write in the first-person, but remember that less is more. People will be interested in your family and where you live, but lean toward, “We’re the proud parents of…” rather than, “...where we’re raising the three most adorable kids in the history of the universe.” ???? After you finish your bio, click the blue “Update” button. Let’s change this so it’s more applicable to an author instead of a business. Step 1: Change the title of the page to “Contact” or “Contact Me”—because there is no “us” if it’s just you. Step 2: Change the URL extension to “contact” or “contactme,” your choice. Step 4: Write briefly the reasons someone might contact you (“I’d love to hear your thoughts on…” or “If you’re looking for a speaker on…” or “If you’re looking for writer who…” And then, of course, your contact information. I like to give people as many avenues of access to me as possible: a URL, an email address, a P.O. Box, etc. I don’t recommend your home address for such a public venue. Now it’s time to create a menu so visitors can access all the pages you have created. To create your menu, follow these steps. Step 1: Type “Main Menu” in the “Menu Name” box. Step 2: Click the blue “Create Menu” button. Next, click the “Save Menu” button on the right side of your screen. After that, click the checkbox next to “Automatically add new top-level pages to this menu.” Then click the checkbox next to “Top Menu.” Last, click the “Save Menu” button. Just two more steps before your website is ready to go live on the Internet! Click the “Dashboard” link on the left side of your screen. Click the “click here” hyperlink under the “Dashboard” heading. You will now see a new heading that reads “Congratulations. Your site is now live, click here to view it.” Do that to see your new website! Congratulations! You’ve taken a huge step today. Add a personal touch by changing your site’s look. You can do this by downloading a new theme. You can even filter the features you want. Search this expansive list for a theme that feels just right to you. Visit other author sites for ideas and to be sure you don’t duplicate (unless you choose to). Click “Visit Site” to see your new theme! And there you have it—you’ve created your author website! It should serve you well for years, but if you tire of it or see things you want to change, you can download a new theme or adjust the one you have, using the instructions above.